In this example, we will group the settings by title. This will be a continuation of our preferences example. When you have provided a bunch of settings, it is beneficial if you can group the settings else user might end up scrolling up and down the settings screen searching for a specific setting. 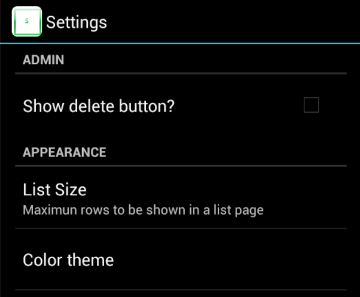 You can group the settings by title as well as using sub-screens. Our preferences file had the following settings. Each group will have its own heading and a divider. We will group the settings into two groups. One would be Admin and the other would be Appearances. All we need to do is place each group of Preference objects inside a PreferenceCategory. Here is the modified preferences.xml. The group titles are added to strings.xml. You can now see the ADMIN and APPEARANCE groups.